Alberto Salvadori, Caroline Soyez-Petithomme, eds. If you look closely at the reproductions of Fredrik Værslev’s work and at the installation views here, you cannot but notice that there is something decidedly strange and funny about them. Those things that would be perceived in other photographs of the same genre as imperfections or parasitical intrusions turn into an affirmation and a comical form of repetition. As the “intrusive” occurrences pile up, the game becomes less subtle than it is in the exhibitions themselves, excepting, perhaps, the last two to date, namely “Inner Beauty” at the Museo Marino Marini and “La Constance du jardinier” (The Constant Gardener), at CNEAI. 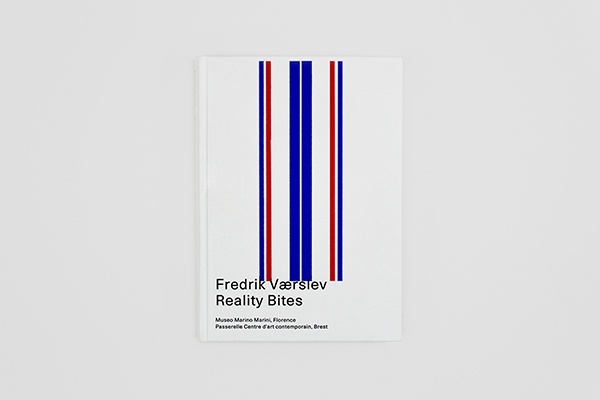 Even if we had supposed that what we are looking at is essentially conceptual abstraction, by the time we come to the last page of this book we are obliged to admit that Fredrik Værslev’s approach is in fact rather incongruous. His pictorial compositions seem to be porous to their surroundings. This aspect of the work takes full advantage of the condensed effect offered by the publication’s format which, in contrast to the exhibitions themselves, necessarily offers only partial views of the work, which is dispersed across various places and moments. The artist has seized the quasi-simultaneity, or ubiquity, allowed by the reproductions of his works and of various installation views. To gather images and fragments of a whole, and to compile and edit these, are basic gestures for book making and publishing. Here, though, these deviate from the exercise we would have expected: they do not yield an artist monograph of an exhibition catalogue. 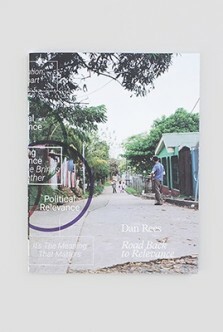 Although the typology of images (reproduction of works and installation views) is the same as that which is usually put at the service of documenting the work, in many of the instances here the reader will notice a number of other elements insinuating themselves onto the page and tracing their own paths across the whole, gaining in intensity along the way. In many of the photographs, the paintings are obstructed by elements as extrinsic as they are surprising, for example dogs, or a man dressed only in his underwear. All of this makes clear that, much as Fredrik Værslev may insist that he is only a painter, there is considerably more going on in his practice, both in this book and beyond. 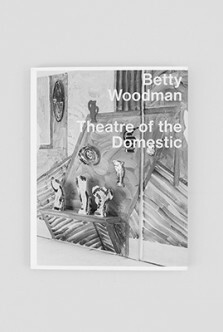 There were some precedents, like for example the artist’s book Mousse published in 2013. In that book, every spread staged a dialogue between an image of a boat tied to a dock (the photograph is almost always identical) and a painting from one and the same series of quasi-virgin canvases, monochromes by default, that bear on their surfaces nothing other than traces of wear and tear, stains and some slight molding. This combination of figuration and abstraction and this cohabitation of paintings and photographs documenting something else were already central to the making of that book. However, the two types of images remained distinct, and the concise format of that artist’s book did not allow the work to be characterized by this aspect. The proposition remained more enigmatic and prey to a variety of hypotheses concerning what motivations might have led the artist to confront these two utterly heterogeneous types of image in one and the same corpus. The pure and simple formal analogy between the surface of the abstract painting and the palm oil spreading along the surface of the water is too obvious to explain this succession of juxtapositions. Another artist’s book, It Girl, appeared in 2014, concomitant with an eponymous exhibition at the Johan Berggren Gallery in Malmö. Fredrik Værslev joined there the two registers that had engaged him in the first Mousse publication. Some “Terrazzo Paintings” are reproduced in full page—a replay of the allover pictorial motif—even if it meant that he had to crop the images to do that. Drawings of dogs (and not just any dog, but the now-dead pet that had belonged to the artist and his mother, Anne Britt Værslev), are interspersed with pages that reproduce the works themselves. 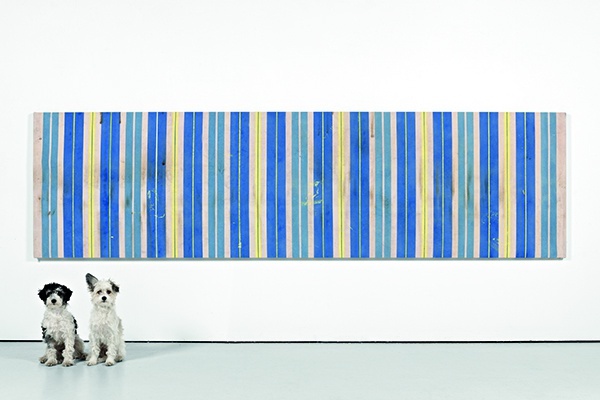 In addition, some of the “Terrazzo Paintings” integrate the representation of the dog, which finds itself superimposed onto the mottled composition. We can see these two books as stepping stones toward the elaboration of the present publication, since they contain the first symptomatic indications of an enlarged conception—at once casual and irreverent—of abstract geometric painting. Reality Bites seems at first blush less abstruse because the works here are documented in very classical fashion, with installation views and frontal reproductions of the work (which has itself been raised to the level of “official reproduction” in the course of the twentieth century) serving in tandem as communication and archiving tools. In these photographs, the work is placed under an intense light that has been perfectly calibrated to render the physical reality of each work as well as possible. The clinical aspect that results from the clarity of these traditional reproductions is decidedly prone to flattening out patterns and colors. Still, the nearly cosmetic perfection that governs the representation of the work and guarantees its optimal illustration nevertheless contributes, with the turning of the pages, to the production of a number of visual dissonances. 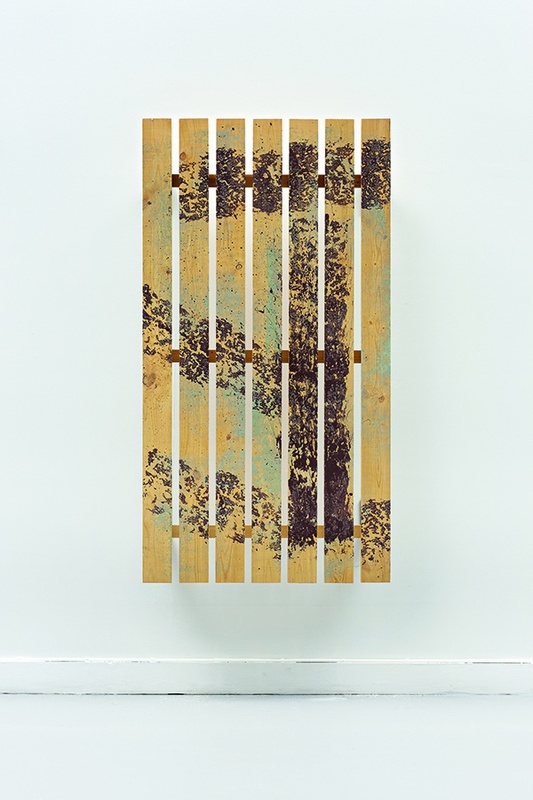 This patina, common to all of Fredrik Værslev’s series, can be more or less noticeable depending on the importance of the reserves of the support itself, the intensity of the colors or the types of patterns. It constitutes an organic and intuitive backdrop that links all the pictorial compositions and supplies the constitutive elements behind the making of these paintings. Because the canvases are at first rolled up and stacked outside the studio, they acquire a patina before they are overlaid with a new patina, when they are brought back into the studio and become the receptacle not only of pictorial gestures but also of the vagaries of work in the studio both on and around the painted surface. It goes without saying that, by painting on the floor, horizontally, Fredrik Værslev does not pretend to be doing something creative or revolutionary, whether from a technical or a conceptual point of view—modernism already drained the whole rhetoric of easel painting. For quite some time already painting vertically, horizontally, in 360 degrees or allover on every wall, as well as on ceiling and floor, has not been a controversial topic of debate. However, the notions of framing and point of view are more crucial ones in Fredrik Værslev’s work. Some canvases, like the ones conceived for the exhibition “Querelle of Brest” at Passerelle Centre d’art contemporain, are stretched on voluminous structures. Other paintings, meanwhile, after they have been fitted together (or, we might say, reframed), undergo further manipulations during the installation process itself. These seem to emerge slightly from the wall because presented with a noticeable outward inclination: the lower part of these paintings is not fixed to the wall, but projects outward from the walls, like wooden shutters on some buildings. Sometimes, the paintings are perfectly joined to the architecture, obstructing a shop window or creating a counterpoint with a glassed bay opening onto the sea or a dilapidated door. Our point of view on the painting, for its part, is sometimes constrained by the architecture of the exhibition space: in Brest, the mezzanine ramp became an integral part of the work by making it impossible for visitors to have enough space to take in the entire series at one glance. The way in which Fredrik Værslev renders his paintings always more porous to different types of visual contexts—be it the architecture or the landscape, urban or rural, the studio or the exhibition space—is constitutive of his entire oeuvre. Beyond the reference to wooden shutters just mentioned, the series of shaped canvases “Brest FR” is directly inspired by the form of constructions placed on windows to protect them while a building’s façade is being restored. The series of paintings on pallets or the aleatory aging of the canvas caused by nature’s intervention evoke the specific environment in which the artist works. His studio, in the village of Vestfossen, is located in a former cellulose factory that closed its doors in the 1970s and was converted into an art center and artists’ studios. The seriality of paintings, as well as their production process—by the meter on great lengths of fabric placed on the ground—certainly owe something to the immensity of the artist’s production space. The large-scale production of pictorial compositions using spray paint attests to an experimental character, aleatory and artisanal—vernacular, even—and resonates with its natural and socio economic environment, situated at the junction between the rural and the industrial. The atelier scenes included in these pages do not necessarily account for these aspects, or for the tension between the slowness of the process delegated to nature and the speed of execution that spray painting allows. In that sense, my studio visit in 2012,  as well as my meeting with Fredrik Værslev and his assistant, Per Christian Brath, proved to be decisive for my understanding of the work and its multiple stakes. It would no doubt have been difficult for me to grasp the richness of this practice outside its production context, encountering it only at an art fair stand or in the white cube of a gallery. As the body of work and its documentation grows, it gains in breadth and continues to reaffirm and renew, each and every time, the way in which painting overflows its frame, both literally and figuratively speaking. His painting is constantly challenging its autonomy in the encounter with annexed elements—for example the graphic chart of the exhibition space—or with its own image taken in a variety of contexts. On occasion, his paintings absorb scraps of text or, perhaps better said, bits of texts that, like logos, outline an image, and it does so following the logical tendency of the reign of communication and of visual culture, in which all media are jumbled together and appropriation is legion. We know that the work of art does not escape this new mediatic cartography and that its reproduction has only continued accelerating its circulation. And Fredrik Værslev’s work, following this mutation, integrates, and of course plays with, the communicational potential therein. The dissemination of images of the work, on the Internet and, in particular, on social networks, ineluctably increases its visibility, and it does so regardless of whether the work is the focus of the image, an accessory to it or merely a background element, and regardless as well of whether it is poorly framed and reproduced. It can be said that the work is fated for a “gaseous” or viral future, and that it is, in this, akin to any other bit in the flux of information that reaches us every day. Any number of supports display it, or use it, fully or partially, as a pattern or ornament. Whether for official or dilettante purposes, the work is ceaselessly transferred from one support to another, on posters, flyers, events and posts on social networks, promotional videos for a show, installation or exhibition views. Although difficult to quantify, all of this has a very specific effect on how the work is seen, considered and, most importantly, woven into a narrative. And yet, Fredrik Værslev’s paintings are caught in a paradoxical movement, because they not only play with, but they also resist, this dynamic of fragmentation of their own image. The works can indeed take on a solemn and minimalist character when they are arranged, whether individually or in a series, so as to be contemplated religiously, aligned according to a classical display. The way the work is presented in space varies considerably: it does not play systematically with the truculent details that adjoin the edges of this fictive and idealistic field of vision that is the white cube, with its attempt to contain our gaze. What one notices, rather, is that Fredrik Værslev’s paintings can have it both ways. What the works indicate with the way they are reproduced here is that they take into account—we could even say anticipate—their circulation under various mediatic forms in public space. The point of view, or the reframing, of the work that the artist offers here pushes the paintings into the side of pretext, for they regularly find themselves treated as elements of in situ installations. The theatricality at work here has to be understood in an accessory or performative sense. The paintings become inextricably linked to the history of their display. Both against and in advance of their existence, their arrangement in the space exerts considerable influence on their process of creation. The theatricality does not stem only from the solemn side that Michael Fried decried, but stems as well from its counterpart: the place of the spectator, which is here exacerbated. What we see here, the polar opposite of an anti-theatricality that is supposedly indifferent to the spectator, is a redefinition in the very status of the different types of viewers who play a role. The intermediaries—assistants, curators, museum directors, gallerists even—are oftentimes the first spectators to contemplate, in total intimacy, the work at different stages of its making and installation. But the artist remains nevertheless the very first spectator of his work, and he regularly extracts himself from it by means of reproduction. In this way, he re-appropriates his work by tracing out the entire path, both of its making and of its becoming image, before and after the work is conceived. Controlling the origins and successions of the work, the artist feeds the narratives, and hence the myth, of its intimate and public life. The position of the spectator here is no longer limited to that of addressee: it is opened up to the position of the user. 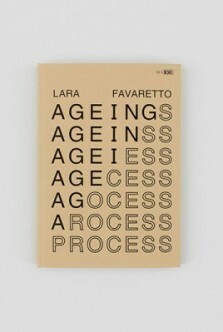 With all the ambiguity of a position that oscillates between the amateur and the professional or producer obsessed by the idea of documenting each instant of a process, Fredrik Værslev and his assistant, Per Christian Brath, photograph and, more importantly, still and print, as in this book, those moments when the work is still latent, whether in the studio or during the installation process of shows. In so doing, they contradict the very nature of these unofficial monstrations that supposedly lack an addressee. Thus, a number of images here are juxtaposed to the frontal reproductions of Fredrik Værslev’s work; some of these were taken and sent to the artist by unknown third parties, and some were gleaned from social networks. More than painting, the question at the heart of Fredrik Værslev’s work concerns the permanence of the images it produces and the hybridity of the roles of the artist, the spectator, the user, the amateur and the professional. The atomizing effect of over-visibility (be it intentional or not) of artworks today goes hand in hand with a rapid consumption that needs little more a few seconds and as many clicks. Mirroring this furtive overall glance, the disappearance or obsolescence of these shots, taken with who knows what ends in mind, becomes imminent as well. Fredrik Værslev cuts against the grain of this cycle, which aims to lessen the impact and importance of the physical experience of the work, and opens up instead an alternative, uchronic perspective, by fixing on paper and rigorously archiving the recordings of the fate of his works. And he is, by the same token, documenting—in and for the fields of art and art history—the forces that inform the practice of instantaneously recording the everyday and immediately sharing that recording with members of a group through some form of media. What is implied here is a new relation to the work, which becomes more complex by the transfer of its reproduction to multiple supports. This immaterial part, which could remain an annex, becomes intrinsic to the nature of Fredrik Værslev’s paintings, as if his works generated and integrated their own heuristics. It should be said that all of this is orchestrated with a lightness of touch that Fredrik Værslev no doubt inherited from the attitude that once defined conceptual art, but is generally a no-show in those contemporary, “post-conceptual” practices that multiply the references simply to justify their existence. The reason for the present evocation of the images that circulate on Facebook, Twitter, Instagram and the like is not to go one step further than an aesthetics or a “post-internet” fate of the work. It is, on the contrary, to extract the work from its abyssal dissemination by transposing it to a fixed medium: the book. It should not be surprising, then, that the bulk of this book is given over to those images that tell us everything, or nearly everything, about Fredrik Værslev’s practice. The source images, for their part, round out the reproductions of works and installation views, and document the provenance of some patterns. The set of images and multiple points of view they draw forth reveals that the critical distance that desacralizes the work can likewise fetishize it. The exponential side of reproductions, under any circumstances, levels out every hierarchy of experience and assumes that, ideally at least, the works should never be out of sight. There is a whole side to this documentation, which some regard as heresy, that works on the conviction that every image of a work is worth taking and saving. And underwriting that is the idea that there is no privileged place or moment to present the work, or delight in it. The artist himself confronts his work to its announced deliquescence in favor of the image and, in so doing, he plays on the contraction visible today around the rarity of aesthetic experience. According to Fredrik Værslev, the work resists every context. And the issue of the exogenous elements that find themselves in the image frame—and that could be perceived by some as harmful to the contemplation of the work—is, first and foremost, a question of perspective and the capacity for abstraction. Painting is protected, in a way, and preserves all of its integrity because it has already experienced this confrontation in the course of the creation process. Its compositions are open and permeable to visual elements drawn from the artist’s immediate environment. What that does, ultimately, is render them infinitely compatible with everything that surrounds them. The choice to reveal this large body of documentation is thus another way of leading painting back to the very concrete reality it issues from. Until I saw the first sequence of images reproduced here, I was having a difficult time imagining how showing the many ways of reproducing this body of work could possibly be of any importance. When the idea was first broached, in Brest in February of 2015, of inserting images of the work taken outside the exhibition context—in homes, or inside or outside the studio—the suggestion struck me more as a postulate than a coherent gesture, something I would not have hesitated to qualify as gratuitous. But I had not yet grasped the fullness of this dimension in connection with the paintings (it should be mentioned that, compared to what I saw in Florence later, the exhibition “Querelle of Brest” was formally rigorous and in general fairly well-behaved and serious). 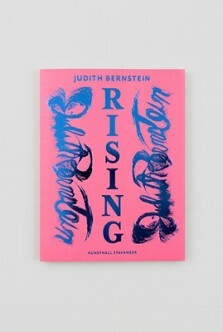 The editorial approach we settled on for this book is in lockstep with the logic of a certain self-mockery whose culmination, at least to date, is to be found at the Museo Marino Marini and the show “Inner Beauty”; the exhibition views from there were the last to come in and constitute the closing point of this book. To return to the images that document the works in unexpected or indirect ways, they do not belong to any of the categories under which we can range the photographic documentation of art. Indeed, there are few precedents for these images known and archived as such, other than interior design magazines, where the interiors of collectors’ homes abound, in fashion magazines,  in images, now legendary, of artists working in their studios, and in the staged portraits, more or less official, of renowned patrons. Peggy Guggenheim’s portrait with her dogs merits a short digression on the subject of Fredrik Vaerslev’s avowed affection for his pets. Between naiveté, sincerity and self-mockery, this staging of the self harks back to the myriad instances of similar images on social networks that publicize an excessive degree of affection. David Joselit’s starting point in this text is the example of Martin Kippenberger, the emblematic figure of the tendency that reared its head in the 1980s and became established in the 1990s with some of Kippenberger’s assistants and friends, Michael Krebber among them. As it happens, not only was Krebber one of Fredrik Værslev’s professors at the Städelschule in Frankfurt, but he has remained a central influence in the development of his work. It is certainly the case that Michael Krebber cultivates the legend of the artist as much more troubled and eccentric than what we find in his younger colleague and former student. Krebber is “a painter who, as he says, is “fundamentally no painter, and a teacher who, he maintains, has nothing much to teach. ” With tongue in cheek, Fredrik Værslev asserts the exact opposite: he pretends to be nothing but a painter. But the influence of the professor, who was one of Martin Kippenberger’s last assistants, is visible in certain aspects of the legend that Fredrik Værslev himself weaves using autobiographical bits and pieces  and, above all, through the multiple collaborative methods he has perfected. The relation Fredrik Værslev entertains with subjectivity need not pass, necessarily, through the dissimulation of his signature by means of ensuring that each new series announces another stylistic rupture. His positioning is more ambiguous, formally speaking, since each series is fairly voluminous, numerically speaking (and this despite the fact that Fredrik Værslev destroys quite a few of the paintings after each show). In other words, the signature is hammered out through repetition. ?From one series to the other, we see the same use of spray painting and geometric patterns—sometimes creating a blurry, out-of-focus effect—painted using a line maker (the small cart on wheels used to trace traffic markings, like the lines separating parking spots, on the ground). This distancing and this constraint imposed on the pictorial gesture contribute to the dissimulation of a part of subjectivity in the elaboration of the pictorial composition. As for the questioning of auctoriality, we need to look for it rather in the layering of the process, in what goes on behind the scenes of the work’s fabrication. Fredrik Værslev never co-signs his works with Per Christian Brath, even though they produce them in concert. Their exchange is reminiscent of other such relations in the history of contemporary art and, more specifically, the relation between Martin Kippenberger and Michael Krebber, in which one could be as influential as the other at various stages of the creative and production process, highlighting possible production errors or aspects that the other would not necessarily have drawn attention to but that become subsequently constitutive of the work. There are, in fact, different sorts of pacts between the collaborators and the artist; Fredrik Værslev and Dan Rees, for example, co-sign one of the “Shelf Paintings” (2009), and the same is true for the collaborative pieces Fredrik Værslev has made with his mother. 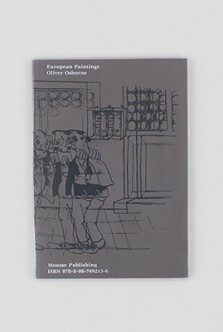 Per Christian Brath, his permanent assistant, on the other hand, is never cited as a co-author; like Michael Krebber for Martin Kippenberger, he is a willing content provider, a volunteer we might say, while the artist remains the controller whose agreement and validation is what prevails in the final result shown to the public. 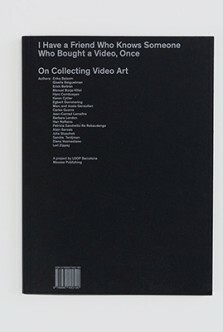 In this book, the contributions by Josh Smith and Matias Faldbakken document the links that the artist entertains with some of his contemporaries and resituate the work in an artistic community and thus in another type of network, but most of all their exchanges reciprocally influence their respective practices. The dimension of failure, or rather of the deceptive work (that is, where the effect of deception is intentional) plays off of the physical experience that is replaced by the (bad) photographic reproduction of the pattern. It is the very link with the architecture of the place, preexisting in the specific case of the “Terrazzo Paintings” through the images of the place and acting as a form of counterweight to all the direct links with architecture, that Fredrik Værslev stages in his work. The creation process has come full circle, since it is the image of a future exhibition site or, more specifically, it is a poorly photographed image of an element of its décor that gives birth to the patterns in the paintings. That is essentially the inverse path of to the one we see in so many of the photographs gathered in Reality Bites. The images are not necessarily ideal reproductions of paintings, and the idea we shall have of them through these “diminished” reproductions will certainly remain partial, or altered. Something of a fiction emerges, then, from these images, and it coexists with the paintings while remaining as legitimate and real as the objects that predate them. “La Constance du jardinier”, a show by Fredrik Værslev curated by Jacob Fabricius at CNEAI, Chatou, France (October 17 – December 5, 2015). I would like to thank Etienne Bernard, director of Passerelle Centre d’art contemporain, in Brest, for having shared my enthusiasm for Fredrik Værslev’s work, and for having trusted me to go ahead with the project in spite of the rather paltry photographs (reproduced here) that I was able to take during my first studio visit. That is how I came to curate “Querelle of Brest”, Fredrik Værslev’s first institutional show. I would like to thank Jean-Pierre Criqui for this reference. David Joselit, “Painting Beside Itself”, in October no. 130 (Fall 2009), p. 132. Daniel Birnbaum, “Man Without Qualities”, in Artforum (October 2005). See “Finishing Touches”, an interview of the artist by Esperanza Rosales, in Mousse Magazine n. 28 (April 2011), p. 237.